It is with some sadness but lots of excitement that I’m announcing that the Advent Calendar is “on pause” for a bit. Those of you who have ordered in the past know that the Advent Calendar was 100% HANDMADE. In previous years, the demand was so great that they sold out in one night. It was a labour of love to get them all made and they were a HUGE hit with the families who got one. I have been working on a plan to make the production of the kits at a bigger and more sustainable scale so that more families can enjoy this as a family holiday tradition. But this Elf (me!) has also had a Special Task Force Mission… in the fall of 2016, my big brother was in a very bad cycling crash and broke his neck. He miraculously made a full recovery (he’s totally OK!). But during the months he was in recovery he asked me to help him with a Big Dream of his. 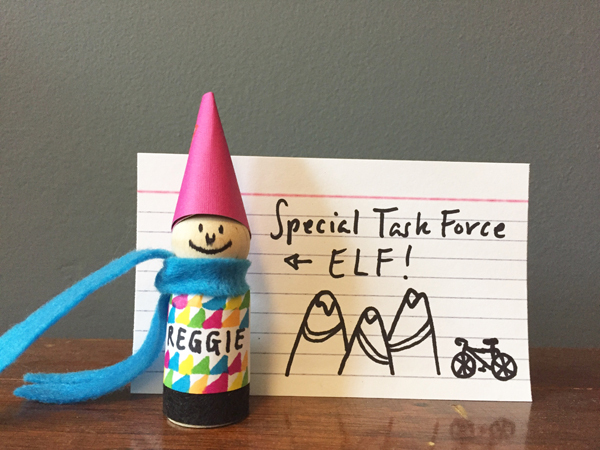 He wanted to start a company called REGGIE that makes really awesome cycling clothes and gear. So that’s what we did. We designed a whole line and opened up our web shop in June and now there are Reggie Riders wearing our clothes all over the world! You can see it all at www.reggie.bike. As you can imagine, this took up – and continues to take – a big chunk of my time, but it was important work. So I am now getting back to the plans to make the Drawn Together Advent Calendars a bigger and more sustainable endeavour so that all kinds of families can enjoy this unique experience again. Please get on the mailing list using the form below and I’ll let you know when the new Drawn Together stuff will be ready to go! Thank you all for your support and understanding! “OHHHHHH MY GOSH!!! THIS IS SO GREAT!!! WE’VE BEEN WANTING THIS!! EVERY CHRISTMAS THIS HAPPENS! EVERY CHRISTMAS!!!! HOORAY FOR THE NUMBER ONE!! “We loved doing this calendar so much, and I told so many people about it. It really was a wonderful way to force a sit-down-together-time each day when it’s so nutty at Christmas. At first I was doubtful about having time to do it, but we worked it in and it was so fun for the kids (and my husband even participated on days he was home!) that we really looked forward to cracking open that envelope each day to see what we’d be getting up to! “Nothing can describe the absolute joy on my kids’ faces the day when Auntie Lo’s Advent box is delivered!! They know it means 25 days of unbelievable fun and creativity. Everything about it is magical – the gorgeous packaging of each individual day, the beauty of how it looks hanging on our wall, each unique daily card and “activity”/craft/treat found inside each envelope, and of course, the sheer happiness it brings my crazies each morning as they rush downstairs patiently waiting to be told whose turn it is to open the day’s envelope. SIGN ME UP FOR SKETCHBOOK TOUR DATES & NEW DRAWN TOGETHER PRODUCT RELEASES. Contact | Copyright 2017 Drawn Together / The Sketchbook Tour. All rights reserved.